Pacmania came over from the States quite a while back. Initially the game was regarded as odd in that it was relatively non-violent for a computer game, but it rapidly established itself as the number one arcade favourite. Although the craze is over now, there are still a lot of pacfans around. As a classic maze game, Pacman was among the first arcade originals to be copied in numerous forms on to the Spectrum. Copyright owners, Atari International, have been promoting their expensive ‘official’ version since before Christmas, but it competes against some very strong ‘unofficial’ versions. Some are good, some not so good, and there are some interesting variants. In brief, the classic version should have a medium complex maze connected horizontally by a wrap around tunnel. In the four corners are a similar number of power pills. Each pathway of the maze is regularly dotted. In the centre is a ‘home’ for ghosts of differing colours and point values, which are released into the maze at intervals. The object is to take your Pacman, an orange ball with a gobbling mouth, around the maze and eat all the dots to promote to a more difficult screen with more intelligent ghosts. Eating a power pill will cause all the ghosts to turn blue and edible. In this condition they should run away from your approach at a slower speed than yourself. Strawberries appear at intervals and can be eaten for bonus points. This gets off to a rather poor start because it uses the cursor keys for control — an obvious disadvantage with this type of game. Generally the graphics are small (one character size), okay, but not the true pacman size! The sound does bear a resemblance to a chomping noise. Such things included are fruit, tunnels and power pills. Overall, this is not a very impressive or addictive version, but not the worst you can buy. This game got off to a terrible start — there are no instructions whatsoever. Once loaded one of the three skill levels has to be chosen, from easy to ultra-fast. Don’t worry if you make the wrong choice — you merely have to reload the program. The graphics are small, very blocky and primitive. There is no gobbling action, but there are some odd looking fruit for bonus points. Sound and colour are generally poorly used, and the game isn’t worth considering. We get off to a good start here with a nice loading screen (presentation is always a virtue). When the game started I was amazed! It includes a big, full-sized Pacman and set of ghosts — the only problem with this is that they are not as smooth and fast as they could be. The maze itself is a little simple but the general pacfeatures more than make up for this. For instance, you eat the ghosts (after a power pill) just like the real thing and their eyes even return home. The fruit is here too, plus some new ones like pears, all in excellent detail. All in all, this is a very close copy of the original which I enjoyed. It is a shame that the movement is not just that bit better — but they have got it all into 16K too and included good key and joystick option. This version is much more true to the original with a large gobbling ball and ghostly looking ghosts. The maze is uncomplicated due to the big playing characters. The graphic characters move by the block, but this by no means spoils the playability of the game. Eating power pills changes all the ghosts to a deep blue and they start flashing when the power starts to wear off — good. Detailed fruit appear at random intervals to give bonus points when eaten. The sound and colour have been well used. The keys can be redefined and are very responsive. This game presents a difficult choice between itself and Ghosts’ Revenge. This was originally the Campbell Gulpman, which is now marketed by Micromega. 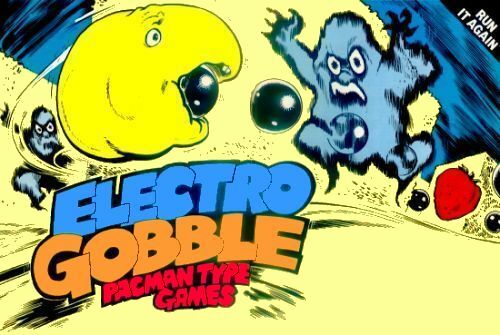 It is a variation on the Pacman theme, which involves you in shooting the nasties. There are a large selection of mazes, speeds and skill levels. The graphics are small but smooth, but I think colour could be better used. On the subject of control, the keyboard is poor — cursor, but it does offer Kempston joystick. Generally this is a nice variation, playable but for me not over-addictive. This must be one of the oldest pieces of software available on the market. Gulpman gives you a choice of 15 mazes which look very blocky, four chasers also of primitive character design, and incredibly, 81 skill levels ranging from unchallenging ghosts to super non-human ghosts. No power pills, but lasers defend you. Fruit and warp tunnels are non-existent. An ageing game, but with plenty of choice. Gobble a Ghost is packaged very well. Looking at the cover, I thought, ‘This could be the one.’ Boy, was I wrong! The game is no way a close Pacman. It has poor graphics, no fruit and stupid ghosts. These poor spectres seem to like getting into a chain, making them easy prey after eating a power pill. Playability is not very high at all — an average to poor version. C.D.S. come up with a conventional style game but have failed in reproducing arcade-like moving characters. The maze is well drawn though. The characters are small but quite colourful. The ghosts give no indication that they are about to become invulnerable again after eating a power pill. The game plays quite well but the ghosts don’t seem really eager to get you. Sound could have been better used but the keyboard play is quite good with fairly positioned keys that are responsive. Here the graphics are on the small side but at least they are pretty smooth. The maze seems very big (too big) making the pace a bit slow, and I don’t think this is a very good version really. Although fruit bonus points are included both Pac and the ghosts have been changed (sacrilege!). The key layout isn’t one of my favourites either. I didn’t really enjoy this one — mind you, it’s getting on a bit now! With this particular version it can take up to five minutes to eat up all the dots in the maze, not because the game is slow but because the mazes are so large and complex. The characters move smoothly and are quite colourful but small. Power pills have the usual effect of turning ghosts edible. A warp tunnel is included. As the game progresses the speed increased dramatically until the game is totally unplayable. Not the best, but very fast. Good controls, joystick options and large, almost full-sized pacgraphics which are smooth too — YES, I’m telling the truth. This has the best character movement around the maze. It also includes some new features like invisible mazes. Tunnel and power pills are included but, alas, no fruit. Micromania don’t seem to have attempted a direct copy version but have produced a fresh variant. Although I say that, I would like it to have the original features too, but one cannot have everything. The first impression this version gave me was that it must be the best ghost gobbling game on the market — at the moment. The characters move smoothly and are well drawn, with the ghosts looking very much like the arcade equivalent. The star of the show looks very convincing as it gobbles its way continuously around the good-sized and well-planned maze. Several non-characteristics of the original arcade game crop up during play — no fruit for one, worst of all the ghosts give no indication when changing from edible to non-edible states after a power pill has been eaten. Being able to choose your own skill level also become unrealistic. One feature this version has that no other does is the invisible maze — just to make life a little more difficult. Both colour and sound have been put to good use, tunes adding a nice intro to each new-life screen. The keyboard is just right. A very good version, but it would be difficult choosing between this and the R & R version. Like a lot of these games, this version is quite old, and it shows. It is very primitive with its design and graphics. The maze is exceptionally complex, with the odd lemon positioned randomly in it. Power pills, too, appear randomly placed. Ghosts move about the maze not caring at all whether you eat the dots or not. The game does have 12 different mazes, but the terrible cursor keyboard layout is quite unresponsive — if not positively erratic. Can’t be recommended apart from historical interest — Maze Chase to 3D Lunattack — there’s encouragement for you! No need for intros here as every self-respecting Spectrum owner has heard of Horace (if not, why not?). This is an excellent variation which has stood the test of time well. I remember buying this one over a year ago and it still has appeal. Some details like the ‘finishing’ of the maze are a little bit primitive by today’s standards, but this still outdoes many newer games. If anyone has not got Hungry Horace get it! Horace cannot be called a traditional Pacman game — there are no ghosts for a start off, just park guards which multiply after a set time. The three mazes are very simple indeed, though quite well drawn. Power pills don’t exist either, instead there is an emergency alarm bell. Ringing the bell will cause the guards to freak, allowing you to throw them out of the park. The characters are well drawn and move smoothly. Colour and sound are well used. Totally different from the arcade version. This is a fairly original game. The maze has been turned into a 3D maze using colour. It is quite realistic too. The man runs behind hedges so that only the top half of him can be seen. Bonus features apart, this is basically a Pacman type game and it’s a reasonably good one too. The game offers user-definable keys; it’s playable but I still prefer the fruity original. Nonetheless this is a good version. The only 3D maze game out of the bunch, essentially everything else is the same — ghosts chase in a hazardous sort of way, power pills aid your task. The differences are the 3D effect and ‘you’ are a real running, but small, man that walks over the dots. Sound and colour are average. I didn’t really like the 3D effect maze, but the game itself plays averagely. Novel. Like most of the really early versions, Artic’s has small and rather uninteresting characters of a small size. Power pills but no bonus fruit in this fast game. Generally pretty uninspiring. Artic first produced Gobbleman for the ZX81 — it played a very vicious game even then. This version is even faster. The maze is nicely drawn and is quite complex. The characters are small and quite insignificant compared with the size of the maze. Eating power pills causes the ghosts to pulsate — not a very good effect. No fruit appear at any time, having included them would have helped the game along a bit. Colour and sound is not at all well used, although the keys are well positioned and responsive. Please note that the percentages given in this table do not reflect what the game might or did get in the main review and should only be seen in relation to each other.